A fine-sounding delay that really comes into its own when used for special effects. Tempo value is rounded up. Variable pitch cannot be bypassed. Expensive. Waves built its reputation on a line of precise, flexible and original plug-ins, but over time, it's drifted into the realms of hardware emulation, as epitomised by its SSL and API Collections. The company's latest wheeze is to use the skills picked up during development of the latter to create its new line of Hybrid plug-ins. 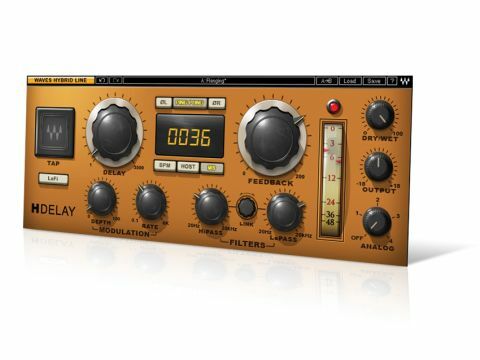 The all-new H-Delay is similar in approach to the classic TC Electronic, Bel and Lexicon hardware digital delay lines - in fact, Waves actually mentions the famous Lexicon PCM 42 in its literature. So what you get is delay (up to 3500ms) coupled with modulation and filtering, making it good for everything from simple slapback echo to flanging and phasing effects. The most fundamental setting is the delay time, which can be set in milliseconds, BPM or synced to the host tempo, and adjusted with the Delay and Feedback knobs, or by entering times in the display window. There's also a handy tap-tempo pad. Although the plug-in doesn't have individual left/right timings, if you load it as a 'stereo' or 'mono to stereo' plug-in, it offers a ping-pong mode and you can also individually flip the polarity of each side. Pitch modulation is limited to a triangle-shaped LFO with adjustable depth, but with LFO frequencies up to 6kHz, there's potential for serious sound manipulation. "The Analog modes are great for rounding off the edges and making the results less clinical." There are flexible low- and high-pass filters (both go from 20Hz to 20kHz) for tailoring the delay signal and once these are set, you can use the Link knob to adjust them simultaneously, like a band-pass filter. There's also a lo-fi setting that makes the delay signal a little scratchier (it emulates the lower sample rate of old school digital delays), and four coloration settings via the Analog section. The manual simply says that these affect the sonic character of the effect - in practice, they add distortion to different parts of the frequency spectrum. We also noticed that the Analog modes work on the whole signal, ie, also treating the dry signal. Although it's subtle, these Analog modes are great for rounding off the edges and making the results less clinical. Analogue tape and other vintage delay units had an uncanny and interesting side effect: when you shifted from one delay time to another, the pitch of the echoes changed. With tape delay, this happened because there was a single loop of tape used to produce the delay, and different delay times were achieved by changing the speed of the tape's playback. Sure enough, people soon began using this quirk intentionally to bend sounds on the fly. With early plug-ins, this side-effect was lost in translation, but developers eventually began emulating classic tape delays. Even then, efforts to reproduce the effect in software were hindered by digital-sounding artifacts. Waves has managed to avoid this with H-Delay and produced a delay plug-in with true hardware-style pitch behaviour that you can use in real-time for bonkers effects or as a pitch-modulating unit. We found that this can be useful and enormously creative, but on occasion, wished we could switch it off. When combining short delays and modulated pitch, H-Delay produces excellent chorusing and flanging - with the LFO speed pushed right up, it gives off the more metallic tones of a ring modulator. Automating these moves can create smoothly-changing special effects, too. Like all Waves plug-ins, Hybrid Delay offers cross-platform, cross-application support and rock-solid reliability, and as a straightforward delay, it's simple and sonically flexible. But its variable pitch behaviour is what marks it out, and with a little automation, this enables you to emulate the real-time 'hands on' sounds you'd expect from analogue gear.